Local Food is known to be Trendy, but is it Also Eco-Friendly? CustomGroceryBags.com has the ability to produce premium eco-friendly promotional bags at quantities large and small. Our low minimum of only 250 bags makes it possible for virtually any business or organization to promote themselves and still be earth conscious. We also pride ourselves in being able to fulfill extremely large orders with the same attention to detail. We could go on about our impressive client list, but we prefer to let our superior product and service to speak for us. Most importantly, we strive to make your ordering process as efficient and enjoyable as possible. Give us a call today and speak to one of our knowledgeable and friendly representatives. We believe that great service should accompany a great product. 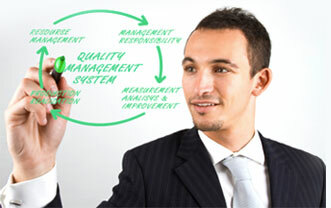 That is why we have created our Quality Management System. With this, we are able to ensure that your order receives individual attention and that you are informed every step of the way. We firmly believe that our method of customer service is the most personable and proactive in the promotional products industry.